Trying to figure out which survey questions to use in an employee satisfaction survey is tough. You want to know everything, but you have to balance what you want to collect, while trying not to overwhelm employees or influence their answers. But we’re here to help. We selected 29 important employee survey questions for every topic you’d like to cover. Here are 29 questions you can use in your next survey. Get started right away with this list of 40 additional employee surveys questions you can use today. These questions explore how employees align themselves within the organization’s vision, mission and values, as well as what they think about the organization’s commitment towards ethics & social responsibility. Are you inspired by the purpose and mission of your organization? If employees believe in their organization’s purpose, they’ll be much more likely to go above and beyond in their work. Are your organization’s values aligned with the values that you consider important in your life? To have a true “culture fit,” personal values should line up with the organization’s values. With that, employees will feel more true to themselves and will likely feel happy and fulfilled. This question measures what’s known as the employee net promoter score. Enps the most powerful way of measuring employee advocacy. The thinking is, if you truly like an organization, you’d be willing to recommend it. Do you feel like your organization protects its employees from discrimination? Employees need to feel psychologically safe in their work environment to be able to thrive. If an employee feels like they are being discriminated against, it needs to be addressed promptly and with great care. These questions shed light on how employees feel about the working environment. Does your work environment allow you to work distraction-free when you need to? Providing distraction-free zones can have a great impact on your team’s performance and wellbeing. Are you satisfied with the level of comfort in your physical workplace? Wellness at work plays an important role in the level of productivity of employees. Making sure they are comfortable can only increase output. Do you have access to the material resources you need to do your work properly (equipment, supplies, etc.)? A great question to know if your team has everything they need to achieve their work. It’s important that the culture is also reflected in the environment, and Zappos is a great example of that. If an organization claims that it’s important for employees to have creativity, but doesn’t let them decorate their own desk, the employees may sens a disconnect between the culture and the environment. These questions address both the quality and the frequency of recognition that employees receive. Are you happy with the frequency at which you receive recognition from your manager? Giving recognition to your team can have a greater impact if it’s done often and promptly. Do you feel like your organization celebrates its accomplishments and learnings? This question clarifies the culture of recognition throughout the company. Encouraging recognition on a broad scale inspires recognition on a small scale. Do you feel like recognition is meaningful when you receive it? Receiving recognition that is too generic may not have the same impact as a more detailed praise. When giving recognition, try to make it as specific as possible. These questions represent the quality and frequency of the feedback that employees receive, and considers how of their opinions are received by the organization. Do you feel like your manager cares about your feedback? This question helps to measure how valued an employee feels at work. It is equally as important to implement feedback when it is received. Do you feel like you can share your honest thoughts with your manager? Employees should feel safe to talk openly and honestly. By removing fear, you help employees remain engage. Do you feel like your organization encourages you to give your opinion? Encouraging employees to share their opinion is how you can generate ideas and great discussions leading to growth. 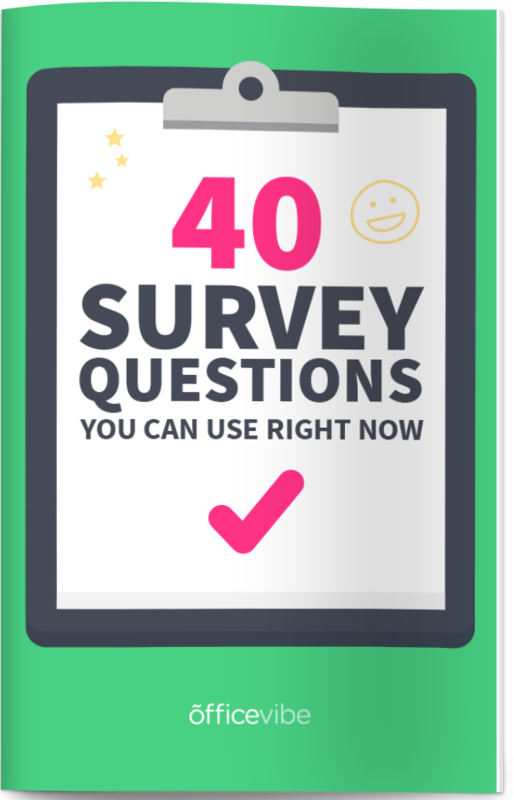 Get started right away with a list of 40 additional employee surveys questions you can use today. These questions explore how satisfied employees are with their compensation and benefits, their role inside the organization, and as their overall work environment. Do you have the flexibility to take time off when you need to? Employees should never be scared to use their flextime, and they should feel like they have enough autonomy to manage their own schedule. Do you feel that you maintain a healthy balance between work and your personal life? Work-life balance will be one the most important engagement issues over the next few years. This is an essential question to ask, and something that every organization should be keeping an eye on. Do you feel like your work contributes to the goals of your organization? People need to feel a sense of purpose in their work. They want to know that their work matters and they’re not just punching in and punching out. Do you think that your responsibilities are clear? Employees need to have a clear definition of what their responsibilities are. Otherwise, they won’t be as productive as they should be. These questions represent the level of autonomy employees have, and whether or not they’re improving their skills. Do you have the opportunity to grow within your organization? Personal growth and having a career plan is one of the keys to employee engagement. This question offers you some insight into whether employees are planning to stay or not. Managers should be having regular conversations about goals and the future with their employees. How would you rate the way your organization makes use of your strengths? For employees to be engaged, they need to be evolving and growing. This question gives you insight into how well you’re utilizing your employees to their full potential. Do you feel like you have the opportunity to improve your skills? For employees to thrive, they need a healthy dose of challenge. To grow in a team, employees need to be able to develop themselves and improve their skills. Do you feel you have enough freedom to decide how you do your work? It’s important not to micromanage your employees and the best way to do this is to focus on the goal and not on the process. Everyone has their own way of working. You need to let your team decide how they’ll do the work and be there when they need support. These questions dive into the trust, communication and collaboration between employees and their direct manager. How would you describe your relationship with your manager? It’s a very broad question, but the feedback that it gathers can engage great discussions. Do you feel like your manager is someone you can trust? Trust is necessary in a team’s day-to-day so that everyone feels like they are present for the rights reasons, working towards common objectives. Do you feel like your manager has a good level of transparency with you and your team? To build trust in a team, a manager needs to be as transparent as possible. You don’t need to say everything to your team, but they need to be aware of what is going on. These questions explore trust, communication and collaboration among peers. Can you count on your peers when you need help? Employees need someone at work they can turn to for help, which is why we’ve often recommended mentorship programs or “buddy” programs at work. If an employee knows they have someone they can always turn to, they’ll be more relaxed and comfortable. Do you and your peers collaborate well together? People need to feel included, and you’ll want to look at this to measure where you stand and what you can do to improve that sense of inclusion. Do you have someone at work that you consider as a friend? Having friends at work can have a great impact on employees and on the organization. Not only does it increase employee retention, but it also improves company culture. Do you think that your peers welcome opinions that are different from their own? It’s one thing to encourage different opinions, but it’s another to accept them and have honest discussions about them. It’s essential to have peers who are open-minded and can accept different opinions. The discussion that it creates can generate great ideas. Which Survey Questions Do You Use? Any useful ones to share with our audience? Let us know in the comments below!